Reserve your accommodation in first class hotel online. Rent a car in Kosice From Kosice aiport at the lowest market rates. Tour guiding With certified guides around the town and close areas. A book "Walks around the city"
Welcome to Kosice, the metropolis of Eastern Slovakia, the second largest city after capital Bratislava . Lying in the valley of the River Hornad in the basin that shares its name, Kosice is a regional administrative centre and Eastern Slovakia's hub of industry, commerce, science and culture. The country's second largest city, Kosice curently has a population of more than 250,000 inhabitants. As the Regional Administrative Center for Kosice County, Kosice provides government services to an area encompassing 6 753 sq. kilometers and serves over 766 000 people. Kosice is a city with an eventful and illustrious past, its earliest recorded mention dating from 1230, when it is referred to as "Villa Cassa". The coat of arms is the oldest in Europe, a fact attested to by a letter dated 1369. The city's historic sights - from various eras - are concentrated in the historic centre, which is an Urban Heritage Area. The reconstructed main street, lined by burgher houses and palaces, offers visitors a pleasant stroll and is also the venue for major events in the life of the city. St. Elizabeth's Cathedral, considered to be one of the most beautiful Gothic structures in the world, was built between 1378 and 1508 and is the city's oldest architectural landmark. Particularly imposing is the main altar with its three oversize statues and forty-eight panel paintings, while the lateral altars, Gothic wall paintings and sculptures add to the charm. Refurbishment work on the Cathedral is currently under way. St. Michael's Chapel located to the south of the Catedral, is a single-nave Gothic edifice from the 14th century. Originally a cemetery chapel, it is the city's second oldest building. The Forgach Palace, an Empire style, 2 story palace, built for the nobility in the early 19th Century, currently houses the State Science Library. 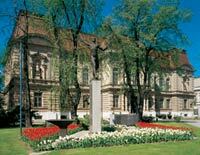 The Eastern-Slovakia Museum, a majestic neo-Renaissance structure built in 1899, anchors the north end of the square. Exhibitions on eastern-Slovakia regional development, numismatic collections, and the Gold Treasure of Kosice - hoard of golden coins and other golden objects - are located here.